Mobile savings app Ibotta, which got its start by targeting millennial shoppers who no longer seek out and clip paper coupons, has been working to re-think the role smartphones can play when it comes to shopping in the offline world. To date, that’s largely involved submitting receipts and scanning barcodes in order to save on in-store purchases, including those from grocery stores. Now the company is making it even easier for shoppers to save with the introduction of a smart shopping list that finds cash back for you, automatically. Denver-based Ibotta, which is backed by $20 million in funding, is one of the more popular mobile coupon apps on the market today, among a growing group that also includes apps like Groupon’s Snap, Checkout 51, Shopmium, SavingStar and others. The app is used monthly by over 2 million active users who shop both in-store or online, and then redeem their receipts for cash back. The app can also work with stores’ loyalty cards, if applicable, to make the process simpler. Instead of clipping newspaper coupons, consumers looking to save on grocery items and other purchases interact with the brand in order to earn cash back – generally the same amount you’d earn using a coupon, like $0.25 up to a $1, for example on grocery purchases. Users tap buttons on each rebate they want, then answer quiz or survey questions, read a fact about the product, get a recipe, share the item on social media, watch a short video, and more, in order to redeem their savings. Brands love this because it means they’re able to communicate with their customers directly, and consumers like it because it means they can still save without having to deal with cutting out coupons from a newspaper or circular. In addition to rebates from a variety of consumer package goods companies, Ibotta also offers “any brand” savings as a way to encourage shoppers to use the app. That means you could save money on any gallon of milk, loaf of bread, carton of eggs, or other common purchases, without having to buy a particular product. The new shopping list feature builds on this “any brand” program, Ibotta says, allowing consumers to add any product across any category to their list and then automatically see which savings and cash back offers are available to them. The smart shopping list at launch works with over 150,000 stores across the U.S., including Target, Safeway, Costco, Whole Foods, Walmart, Publix and more. To date, Ibotta’s “any brand” program has delivered over $25 million in cash rebates to shoppers, but it still requires that users browse through the list of rebates and select them in the mobile app. Ibotta will then return a list of matching coupons and cash-back offers you can use to save on the items you’re looking to buy. You still have to jump through the hoops of interacting with the brand’s content and verifying your purchases, but it does save time in finding matching rebates in the first place. At the end of the day, Ibotta may still require some work to use – but so did paper coupons. However, the app appeals not only to a younger demographic that no longer clips coupons but cares about savings, while also earning the love of the extreme couponing crowd that stacks Ibotta’s offers with paper coupons to save even more. 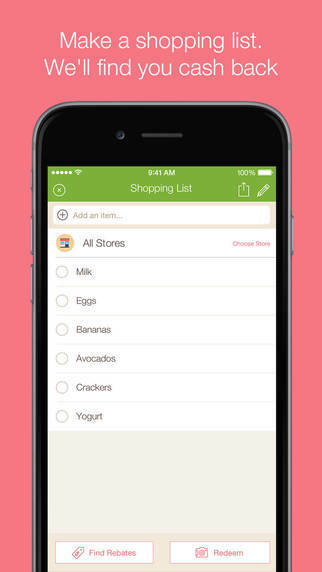 Ibotta’s updated app with the smart shopping list is a free download on iTunes and Google Play.